The MG08 Series will be available in Q1 this year. Japanese electronics giant Toshiba has announced new hard disk drives in Dusseldorf, Germany. They’re called the MG08 Series and are, according to Toshiba, the industry’s largest capacity 16TB Conventional Magnetic Recording (CMR) HDD. 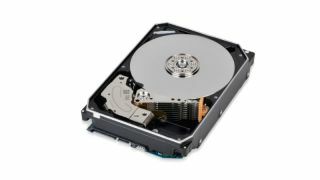 Seagate and WDC, the two other big hard drive vendors are betting on HAMR and MAMR technologies respectively. The MG0 has a third more capacity than today’s 12TB drives, and 14 percent more capacity than earlier models. The hard disks are compatible with most apps and operating systems and are adapted to mixed random and sequential read and write workloads both in the cloud and on premises. The disks offer a 7,200 rpm spinning and 550TB per year workload rating. Then, there are also 2.5 million-hour MTBF, 512Mib cache buffer and an option to go for either SATA or SAS interface. The form factor is industry-standard 3.5-inch. Toshiba believes these new disks will help mitigate the effects of enormous data expansion that we’ve been witnessing in the past couple of years. The disks aim to help cloud-scale service providers and storage solutions designers to achieve ‘higher storage densities for cloud, hybrid-cloud and on-premises rack-scale storage’. The device is expected to hit the shelves in the first quarter of this year. Toshiba is yet to announce the pricing. “Toshiba has delivered its industry-leading 16TB capacity and improved power efficiency by utilizing the 9-disk helium design, introduced last year in 14TB models, and its own advanced precision laser welding process to ensure the helium remains sealed inside the drive case,” comments Larry Martinez-Palomo, General Manager, HDD Business Unit, Toshiba Electronics Europe.